I was a member of Intelligent Data Analysis Group at Fraunhofer FIRST and TU Berlin (Berlin, Germany) from Nov 2005 to Oct 2007 ... to get this incredible poster! I took part in Machine Learning Summer School 2007 in Tübingen, Germany. 2008/03/24 I got my PhD (Thesis advisor: Prof. Kazuyuki Aihara) with "Univ. of Tokyo, School of Information Science and Technology President's Award". 2008/04/01 I moved to Masashi Sugiyama's group at Tokyo Tech. 2009/04/01 I moved back to Department of Mathematical Informatics, University of Tokyo to join Kenji Yamanishi's group. 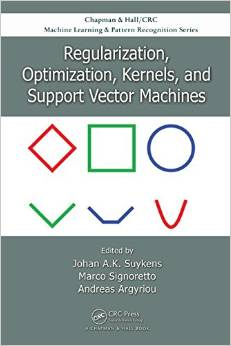 2009/12/12 Check out my talk at the Optimization workshop at NIPS. 2010/6/22: Slides and code for my talk at ICML 2010. 2011/8/26: Slides and exercises for my lecture at DTU Ph.D. Summer Course on Machine Learning. 2012/1/26: Slides for my talk in informatics seminar at Kyoto University. 2012/8/15: Slides and exercises for my lecture at DTU Ph.D. Summer Course on Advanced Machine Learning. This year, I have included an interactive demo to play with convex conjugate function pairs in MATLAB. 2013/8/14: Slides and other materials for my lecture at DTU Machine Learning Summer School. 2013/10: I joined TTI-C as a Research Assistant Professor. 2014/3: I gave intived talks at ISM and Kyoto University. 2014/8: Slides and other materials for my lecture at DTU Machine Learning Summer School. 2015/11: After spending two wonderful years in Chicago, I joined MSR Cambridge as a Researcher. Multi-level variational autoencoder: Learning disentangled representations from grouped observations. Diane Bouchacourt, Ryota Tomioka, Sebastian Nowozin. AAAI 2018.
f-GAN: Training Generative Neural Samplers using Variational Divergence Minimization. Sebastian Nowozin, Botond Cseke, Ryota Tomioka. NIPS, 2016. Data-Dependent Path Normalization in Neural Networks. Behnam Neyshabur, Ryota Tomioka, Ruslan Salakhutdinov, Nathan Srebro. ICLR, 2016. Interpolating Convex and Non-Convex Tensor Decompositions via the Subspace Norm. Qinqing Zheng, Ryota Tomioka. In Advances in NIPS 28, pages 3106-3113, 2015. Norm-Based Capacity Control in Neural Networks. Behnam Neyshabur, Ryota Tomioka, and Nathan Srebro. COLT, 2015. In Search of the Real Inductive Bias: On the Role of Implicit Regularization in Deep Learning. Behnam Neyshabur, Ryota Tomioka, and Nathan Srebro. Workshop track poster at ICLR, 2015. Multitask learning meets tensor factorization: task imputation via convex optimization. K. Wimalawarne, M. Sugiyama, and R. Tomioka. In Advances in NIPS 27, pages 2825-2833, 2014. Non-negative Multiple Tensor Factorization. Koh Takeuchi, RyotaTomioka, Katsuhiko Ishiguro, Akisato Kimura, and Hiroshi Sawada. In Proc. ICDM 2013. Quantitative Prediction of Glaucomatous Visual Field Loss from Few Measurements. Zeng-Han Liang, Ryota Tomioka, Hiroshi Murata, Ryo Asaoka, and Kenji Yamanishi. In Proc. ICDM 2013. Infinite Positive Semidefinite Tensor Factorization with Application to Music Signal Analysis. Kazuyoshi Yoshii, Ryota Tomioka, Daichi Mochihashi, and Masataka Goto. In Proc. 30th International Conference on Machine Learning (ICML 2013). 2013, Atlanta, USA. [SI & Demo audio]. Perfect Dimensionality Recovery by Variational Bayesian PCA. Shinichi Nakajima, Ryota Tomioka, Masashi Sugiyama, S. Derin Babacan. In Advances in NIPS 25. 2012, Lake Tahoe, NV, USA. A Combinatorial Algebraic Approach for the Identifiability of Low-Rank Matrix Completion. Franz Király and Ryota Tomioka. In Proc. 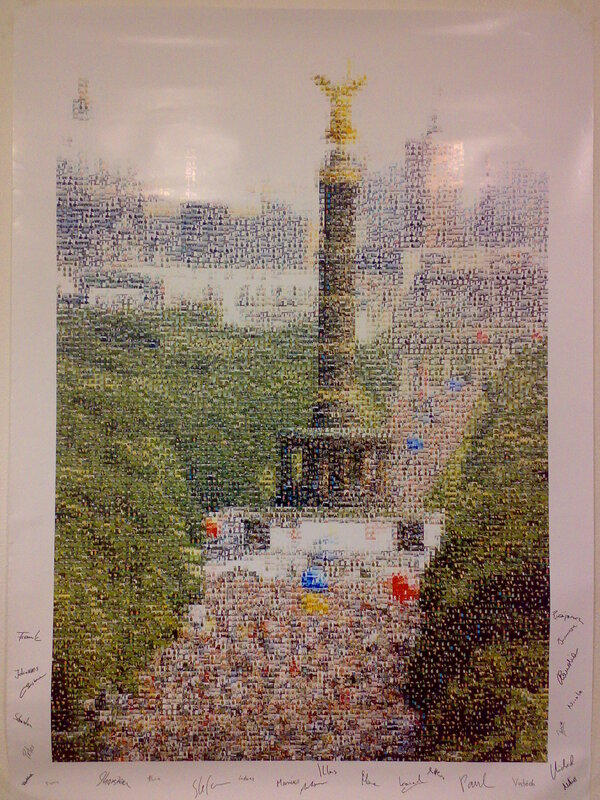 of the 29th International Conference on Machine Learning (ICML 2012), Edinburgh, UK. Tensor Factorization Using Auxiliary Information. Atsuhiro Narita, Kohei Hayashi, Ryota Tomioka and Hisashi Kashima. In Proc. European Conference on Machine Learning and Principles and Practice of Knowledge Discovery in Databases (ECML PKDD), pp. 501-516, Athens, Greece, 2011. Best Student Paper Award in Data Mining. Global Analytic Solution for Variational Bayesian Matrix Factorization. S. Nakajima, M. Sugiyama, R. Tomioka, In Advances in NIPS 23, pp. 1768–1776. 2010, Vancouver, Canada. 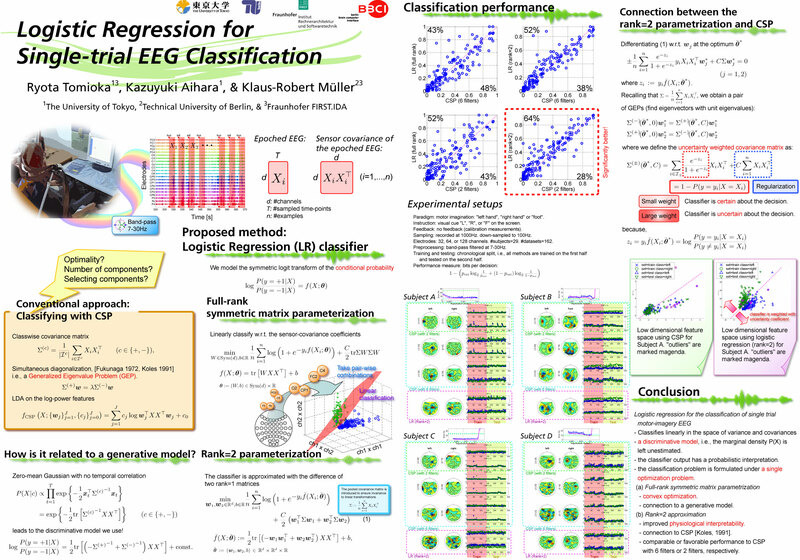 Theoretical and Experimental Analyses of Tensor-Based Regression and Classification. Kishan Wimalawarne, Ryota Tomioka, Masashi Sugiyama, Neural Computation, 28 (4), 686-715, 2016. Condition for Perfect Dimensionality Recovery by Variational Bayesian PCA. S. Nakajima, R. Tomioka, M. Sugiyama, S. D. Babacan. Journal of Machine Learning Research 16, 3757-3811, 2015. The Algebraic Combinatorial Approach for Low-Rank Matrix Completion. Franz J. Király, Louis Theran, and Ryota Tomioka. Journal of Machine Learning Research 16, 1391-1436, 2015. Discovering Emerging Topics in Social Streams via Link Anomaly Detection. Toshimitsu Takahashi, Ryota Tomioka, Kenji Yamanishi, IEEE Transactions on Knowledge and Data Engineering, 26 (1), pp. 120-130, 2014. Global Analytic Solution of Fully-observed Variational Bayesian Matrix Factorization. 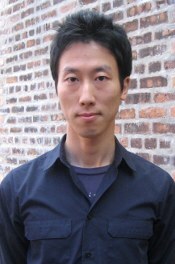 Shinichi Nakajima, Masashi Sugiyama, S. Derin Babacan, Ryota Tomioka, Journal of Machine Learning Research, 14:1-37, 2013. Tensor factorization using auxiliary information. Atsuhiro Narita, Kohei Hayashi, Ryota Tomioka, Hisashi Kashima, Data Mining and Knowledge Discovery, 25(2), pp. 298-324, 2012. Large-Scale EEG/MEG Source Localization with Spatial Flexibility. S. Haufe, R. Tomioka, T. Dickhaus, C. Sannelli, B. Blankertz, G. Nolte, K.-R. Müller, Neuroimage, 2010. Accepted. Modeling sparse connectivity between underlying brain sources for EEG/MEG. Stefan Haufe, Ryota Tomioka, Guido Nolte, Klaus-Robert Müller, and Motoaki Kawanabe, IEEE Trans. Biomed. Eng. 57(8), pp. 1954-1963, 2010. Optimizing Spatial Filters for Robust EEG Single-Trial Analysis, Benjamin Blankertz, Ryota Tomioka, Steven Lemm, Motoaki Kawanabe, and Klaus-Robert Müller, IEEE Signal Proc. Magazine, 25 (1), pp. 41-56, 2008. Sparse learning with duality gap guarantee, Ryota Tomioka, Masashi Sugiyama. In NIPS workshop OPT 2008 Optimization for Machine Learning, 2008. Adapting Spatial Filtering Methods for Nonstationary BCIs, Ryota Tomioka, Jeremy Hill, Benjamin Blankertz, and Kazuyuki Aihara, Proc. IBIS2006, pp.65-70. IBIS2006, Osaka, Japan, Nov. 2006. 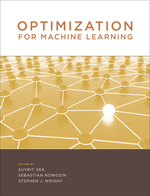 An Iterative Algorithm for Spatio-Temporal Filter Optimization, R. Tomioka, G. Dornhege, K. Aihara and K.-R. Müller, Verlag der Technischen Universität Graz. Proc. 3rd International BCI Workshop and Training Course 2006, Graz, Austria, Sep. 2006. Gaussian Attention Model and Its Application to Knowledge Base Embedding and Question Answering. Liwen Zhang, John Winn, Ryota Tomioka. Jointly Learning Multiple Perceptual Similarities. Liwen Zhang, Subhransu Maji, and Ryota Tomioka. Technical report, 2015. Spectral norm of random tensors. Ryota Tomioka, Taiji Suzuki. Technical report, 2014. Spectrally Weighted Common Spatial Pattern Algorithm for Single Trial EEG Classification, Ryota Tomioka, Guido Dornhege, Guido Nolte, Benjamin Blankertz, Kazuyuki Aihara, and Klaus-Robert Müller, Mathematical Engineering Technical Reports (METR-2006-40), July 2006. Modeling fluctuations in genetic regulatory networks : a structural approach, Ryota TOMIOKA, Hidenori KIMURA, Tetsuya J. KOBAYASHI, and Kazuyuki AIHARA, IEICE technical report. Neurocomputing, 104 (226) pp. 13-17. A Graph-Based Analysis of Stochasticity in Intracellular Networks, Tetsuya J. KOBAYASHI, Ryota TOMIOKA and Kazuyuki AIHARA, Mathematical Engineering Technical Reports (METR) 2004-24, , May 2004. PC member of NIPS 2009 Workshop on Connectivity Inference in Neuroimaging (CINI 2009) and NIPS workshop Optimization for Machine Learning 2011, 2012.